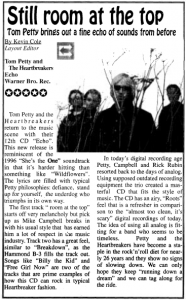 Tom Petty and the Heartbreakers return to the music scene with their 12th CD "Echo." This new release is reminiscent of the 1996 "She's the One" soundtrack in that it's harder hitting than something like "Wildflowers." The lyrics are filled with typical Petty philosophies: defiance, stand up for yourself, the underdog who triumphs in its own way. The first track "room at the top" starts off very melancholy but pick up as Mike Campbell breaks in with his usual style that has learned him a lot of respect in the music industry. Track two has a great feel, similar to "Breakdown," as the Hammond B-3 fills the track out. Songs like "Billy the Kid" and "Free Girl Now" are two of the tracks that are prime examples of how this CD can rock in typical Heartbreaker fashion. In today's digital recording age Petty, Campbell and Rick Rubin resorted back to the days of analog. Using supposed outdated recording equipment the trio created a masterful CD that fits the style of music. The CD has an airy, "Roots" feel that is a refresher in comparison to the "almost too clean, it's scary" digital recordings of today. The idea of using all analog is fitting for a band who seems to be timeless. 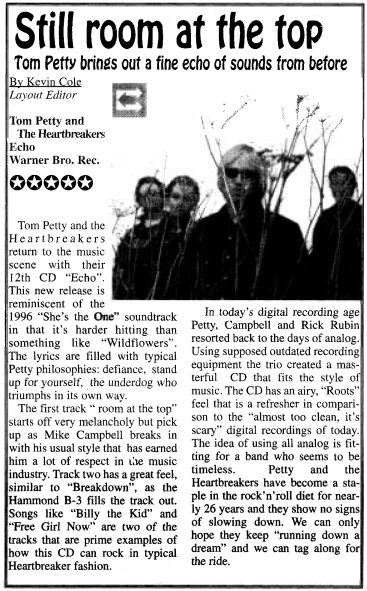 Petty and the Heartbreakers have become a staple in the rock 'n' roll diet for nearly 26 years and they show no signs of slowing down. We can only hope they keep "running down a dream" and we can tag along for the ride.